Beautiful lines! It may be the Cadillac of kayaks but it looks like a seagoing Corvette. Is it a high performance motor yak or a portable runabout? Super stable. Because it looks so seaworthy, most other powerboats do not slow up when passing port to port. No problem. The S4 slides through wakes easily without leaving planing mode. It seems to run a little faster than the W700 with the same motor. I believe the wider hulls act like a pair of skis to help the boat skim across the water. Handling tiller, camera, and a GPS at one time is beyond my skill set. Tracking through turns while planing is wonderful. The boat’s stern does not slide like many skiffs do. The S4 is so easy to spin your body to face the outboard motor because the hulls are so wide. You can keep your feet inside the vessel. Also, the S4 is the perfect vessel for folks who are tired of maintaining their leaky inflatable tenders. Or, people who want a lifeboat that can be used for shade or transport, too. I still think the W700 is the boat that does it all, but the S4 is the boat that does it all, and more! The video shows 15-20 knot wind close chop. No problem. Try paddling against this. P.S. 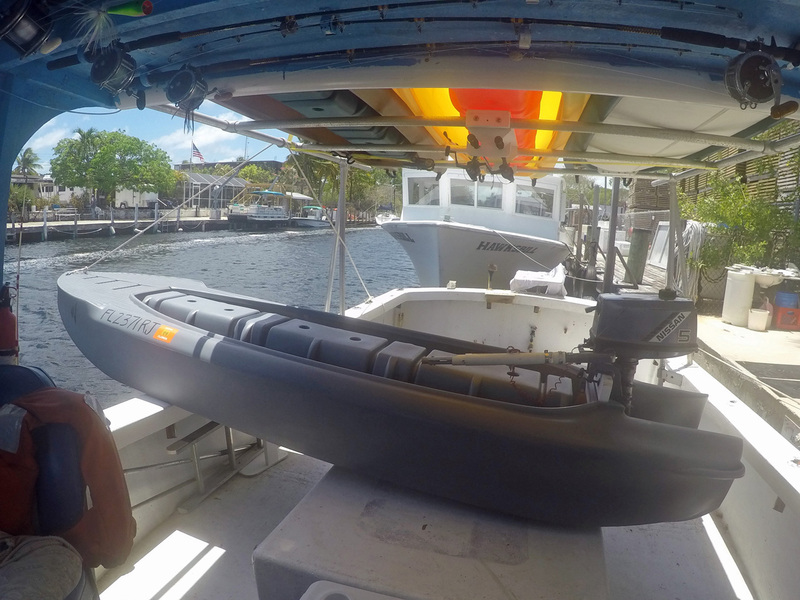 – This boat could make a run from South Florida to Bimini. But, for the time being, I will be staying in waters managed by our Country. Wavewalk S4 in gray with 5 HP Nissan (Tohatsu) outboard motor. Photo shot on the mother ship. We’re still trying to classify this watercraft within the range of things we already know, because this is how our mind works. But the S4 is a class of its own, and its closest relative is the W700. Pretty neat, Larry. I was really surprised not to see splash coming over the bow with that chop. Doesn’t look like the windshield is even needed. I would do same test here in Canada on Simcoe with a 2Hp Honda 4 stroke. I will record the speed. I know you were holding the camera and other things and could not stand, but do you feel that standing while motoring in those conditions would be more comfortable and doable with the extended tiller? Seems like absorbing shock from the choppy water with the legs would be good if it is doable in the S4. Also maybe not get as much spray in the face. I would also like a standing grab bar like some duck boats have, but mounting one might be problematic. Are the holes in the saddle strong enough to stand the strain of a vertical T bar of some sort? I thought about a rope from the bow to hold onto, but would want something that when standing would be able to keep me from being thrown forward. Simply, when you stand it’s because you can drive this way, namely you’re using a tiller extension that features a U joint. Grabbing the tiller extension is enough to provide you with a third point of reference and support for balancing yourself, the other two points being your feet and legs. I just embedded a second video in Larry’s S4 review. It’s unedited footage that shows him driving his S4 in mangrove creeks and tunnels. As much as I like the simplicity and light weight of the Tohatsu 2 strokes, I recognize the limited access due to emission regulations for those commodities. I believe the Tohatsu 3.5 hp long shaft 4 stroke engine will be about the best compromise of weight (portability) and power to propel both the S4 and W700 models at safe planing speed (10-12 kts.). Our local Tohatsu dealer has given me a very fair price to test out a floor model which scales out at 42 lbs. Also, the 3.5 hp 4 stroke engines have throttle control in the handle which is almost a necessity in the tight quarters of the mangrove forest. And, it is good to have more throttle control in close and confused seas. Going fast may be fun but lifting a heavy engine can mean trips to the chiropractor which is no fun at all. Unlike a solid glass boat, there is minimal pounding from the S4 in a chop. The polyethylene hull seems to absorb the beat of the waves. I don’t stand much as I like to stay low in the water like the old school hydroplane racers. The guys who stand up and run their cigarette boats full tilt boogie with four 300 hp Johnsons on the stern end up dead a lot. I recall a Cuban ball player who died in South Florida based on his need for speed. Standing up to stretch or spot fish is enough for me. And, if you check out the photo, that is a homemade telescoping tiller on the outboard but I did not chance standing up while in planing mode. I know you and Yoav recommend the Tohatsu, but sure like the idea of the Honda 2.3 which is 10 lbs lighter. And Honda has a great reputation for low maintenance / repairs. My motorization is mostly used to reach my honey holes for fishing. I did not buy yet in surfing for fun at high speed, but if is fun I will get a second engine 4-5-6HP. I do fish by trolling where I don’t need lots of power, actually the contrary. Best speed for trolling is 1mph (1.8km/h). Also the noise/smoke, weight of the engine are big factors. I do prefer for now the Honda due to: light weight, quiet, 4 stroke (less smoke), and cooled with air. I do run into weeds where cooled with air is the best choice. Keep in touch folks. Have fun and be safe. I own a 2 HP Honda outboard, and I appreciate it a lot for what it is, namely a lightweight and reliable motor. I don’t like to recommend it to people who own a W700 or an S4, because they can use more powerful and user-friendly motors, and their boats can definitely handle the extra HP. Unlike the bigger motors who are water cooled, the little Honda is air cooled, and this makes it more noisy. Some people don’t mind it, but I happen to be sensitive to noise. Another problem with it is that it does not feature a gear shift lever, so it’s never in a 100% neutral state, which means that it’s harder for new users to become safely acquainted with it. Yep, the S4 is roto-molded from Polyethylene resin, which is more resilient than the resins used for making fiberglass boats. Nearly all modern kayaks are made from Polyethylene, and they’re much less prone to crack than similar size fiberglass (or carbon fiber) boats. The Honda 2.3 HP is not terribly noisy at low RPM, but a more powerful water-cooled motor would be even quieter at such RPM. Choosing an outboard power plant for the Wavewalk design is a most personal decision. Most of us chose our vessels because the Wavewalk design is the most versatile, stable, comfortable, and portable vessel that can be paddled or motorized. Choosing paddles is easy. The kayak paddles available from Yoav are best. Almost any canoe paddle is handy as a spare paddle. Outboard motors have a lot more options. First: Choose a long shaft due to the Wavewalk hull depth and transom height. We’ve been though this ad nauseam. Second: Is the motor light enough for you to lift to take on and off the boat? A portable boat should have a portable power plant. Third: Is the outboard powerful enough to get you where you want to go in a reasonable time frame? I just sold a Honda 2 hp air cooled engine because it would not get my W700 up on a good plane. The boat trudged along at top throttle. Putt putting is fine under many circumstances but cruising along at 10-15 knots is a good way to get where you want to go both quickly and safely. Running at 20 knots is surely achievable in a S4 with an 8 hp engine but I will leave that to the more adventurous among us. Tohatsu is the world’s leading manufacturer of small outboards and makes a quality product (good enough for Nissan, Mercury and Mariner to hang their labels on) with fine parts availability. Honda is also a good company in the outboard industry. There are other outboard producers but the small outboard market is limited to a few true manufacturers. Bottom line: decide what you want from your outboard motor. Then, match your motor accordingly. I totally agree, and “portable” can mean different things for different people in different circumstances. Ok guys, you convinced me. I will look to get a second outboard around 3.5-4Hp. I will keep both, 2Hp and the more powerful one. How I can recognize a Toast 3.5 hp long shaft? Is there a label, serial number where I can check the length. That guy that sell does not know it. The 2 and 4 stroke Tohatsu built 3.5 hp long shaft outboards with the neutral/forward shift option have a spacer that resembles a small rudder placed between the shaft housing and the lower unit. You will see this if you GOOGLE [Tohatsu 3.5 long shaft images]. I do not know if the 3.5 four stroke is as peppy as the 3.5 two stroke Tohatsus which I have become most partial to. Give me two days and I will post a review based upon actual experience. My 2 cents: You don’t want a 2 stroke motor if you care about fumes and you don’t like mixing oil in your gasoline. 4 cycle motors have become the standard in outboard motors as well as in all other markets for power equipment that use small internal combustion engines, from leaf blowers to lawn mowers, snow blowers, etc. Thanks for the great discussion on motors. Once my weary aging arms can no longer handle a 5 mile fishing round trip, I’ll probably consider the S4 and motor. At that time, I can’t imagine getting one that weighs more than 30 or 40 lbs, so if someone can give me an idea of how both the Honda 2 and Tohatsu 3.5 compare in moving the S4, it would be helpful, e.g., how fast will each move the S4, and will either of them get it to plane? If neither can get it to plane, I may consider an electric. Now that’s a test ride. Wind, chop, and the S4 cut through it like butter. Looks like another success story for the WaveWalk family, the S4 has arrived, and what a great show it put on for us. I Really wanted to see how it broke through the chop and waves, so thank you so much for the videos. We will take the S4 in bigger waves as soon as ocean water temperature here in Massachusetts gets warm. Pyt………I’ll be looking forward to your comments on how your 3 motors (the Honda, Tohatsu and electric) perform on the S4. We have a lot of oyster bars and hard bottoms here, so moving fast and getting my W to plane would be nice, but also would have to be done with extreme care given how far down the long shaft motor would extend beneath it. Because of this, and I know Yoav would disagree, I’d still like to experiment with a short shaft motor, thinking that it could do a good enough job of propelling me a few miles while simultaneously using a paddle to help make turns if needed. There’s lots of lower units decorating the bottom of our fishing area. The length of the motor shaft is a function of the height of the transom. The propeller must rotate at a certain distance below the surface, and there is no way to achieve this in a Wavewalk with a 15″ short (S) shaft motor. Simply, 15″ short (S) outboards don’t work with our boats. Yoav, guys………With all the discussion on gas powered motors, I wonder if you could provide your 2 cents worth on electric trolling motor use on the S4. What size would you recommend, and not recommend? I assume that none of them will get the S4 to plane, but I’d still like your take on them. I’d say any electric motor would be fine, as long as it features a propeller shaft that’s at least 20″ long. You’ll go slowly, and after some time you’ll probably start thinking about switching to a gas outboard motor, at least on longer trips. The Minnkota Endura C2 is a 30 lb. thrust elec. trolling motor that will be delivered from Amazon for less than a hundred bucks. This is a freshwater motor that will last for many years in saltwater if rinsed after each use. I still use mine after 20 years of use in ocean water. A single deep cycle AGM 50 amp (more or less) battery will provide a day’s enjoyment at 3-4 kts. for a few cents on your electric bill. Try it. You will like it. Later on, you can mount it on your bow when you get your long shaft outboard for your transom. Another question for you guys. On my former go-devil motor, I had to either use the hard to find ethanol-free gas, or add an additive to keep water from forming in my gas tank when using the ethanol gas. Do you know if you can use the “up to 10% ethanol” gas in the smaller Honda and Tohatsu motors you guys recommend without also adding the additive? I’ve been using that “up to 10% ethanol” regular gas for years, with both my Honda and Tohatsu motors, without any problem. In winter (a season that lasts about half of the year here in new England…) I just pour some ethanol fuel stabilizer in the fuel tank, and so far I’ve never had a problem starting these motors in spring. You live in Florida where the air is hot and humid, year round. Ethanol tainted fuel will absorb that humidity and deposit a layer of water at the bottom of your fuel tank. Rec 90 is ethanol free and available throughout our State. My Tohatsu dealer recommends using both Rec 90 and stabilizer to keep our outboards running smooth. I concur. I use Rec 90 in all my outboards, motor home, 1983 GMC 4wd truck, and 2001 Prius. Often, I do not start some of these vehicles for a few months or more but each cranks over quickly and runs smoothly. The prototype Prius, in particular, gets 10% better fuel economy on Rec 90 and runs very smoooth. With ethanol infected fuel, that hybrid rattled like an agitated sidewinder. So, choose your poison. Rec 90 is more expensive. Replacement carbs for the Tohatsu outboards are about a hundred bucks. Pay now or pay later.